Driving west from Salt Lake City, one could be forgiven for thinking ahead to the bright lights of Reno, seven hours down the interstate. After all, there is nothing between the Utah capital and the Nevada border and once in Nevada, well, really, there is just more nothing. No red spires and balanced rocks, no sandstone canyons cleaved by bright blue ribbons below, no bright tapestries of arches and hoodoos, no national parks with gift-centers and happy rangers in Smokey the Bear hats, no tourists looking for hook-ups for their motor homes. No, the 125 miles between the Wasatch Range — the westernmost appendage of the great Rocky Mountains complex—and the border town of Wendover are not what most people come to Utah to visit. (That destination lies south, in the wondrous redrock country that runs from Zion to Arches.) But for those willing to venture off I-80, those dun-colored mountains, dusty valleys, and white salt pans reveal a harsh beauty that is both majestic in its scope and subtle in its declarations. Called the West Desert by Utahns, and loosely described as lying west of I-15, this vast region stretches north to the Idaho border, south to St. George, and is the beginning of the western geological landform known as Basin and Range. An arid (but not waterless) land of short (but sometimes quite high) north-south mountain ranges separated by deep valleys, the Basin and Range is the defining landscape of Nevada and ends at the foot of the Sierra Nevada in California. The most obvious natural feature in Utah’s West Desert is the Great Salt Lake. The remnant of an ancient sea that covered most of western Utah, the Great Salt Lake averages 1700 sq. miles in size with an average depth of only 14 feet. Highly susceptible to drought and rainy years, the size and depth have fluctuated greatly since measurements began in the mid-1800s. Despite the high salinity of the late, fresh-water marshlands provide habitats for millions of migratory birds, while several islands are nesting sites for pelicans. Beyond the great inland sea, mountain ranges and valleys have provided homes to pronghorn and coyotes, miners and hermits. Evidence of the passing of two-legged critters can be spotted in the dilapidated shacks, battered corral fences, lonely graveyards, and empty mine shafts scattered throughout the desert, while sections of the Pony Express and Donner-Reed Party trails can be still traveled. Now bisected by two main highways – I-80 in the north and the older Highway 50 further south – a spider web of dirt roads remains the primary mechanism for exploring this region, connecting mountains to valleys, ghost towns to the occasional fresh water spring, while skirting two huge military bombing ranges and a chemical/biological warfare testing center. Upon first look and from a distance, all mountain ranges can look the same, especially in this austere region. With closer inspection – hiking on the ridges and peaks, and in the passes and canyons –personalities grudgingly emerge. Each mountain is a unique island of ancient rocks surrounded by a sea of valley sediment. The patina of history can be scratched, if so inclined, and stories deciphered. For the rock hound or amateur paleontologist, primeval fossils and colorful minerals can be unearthed. 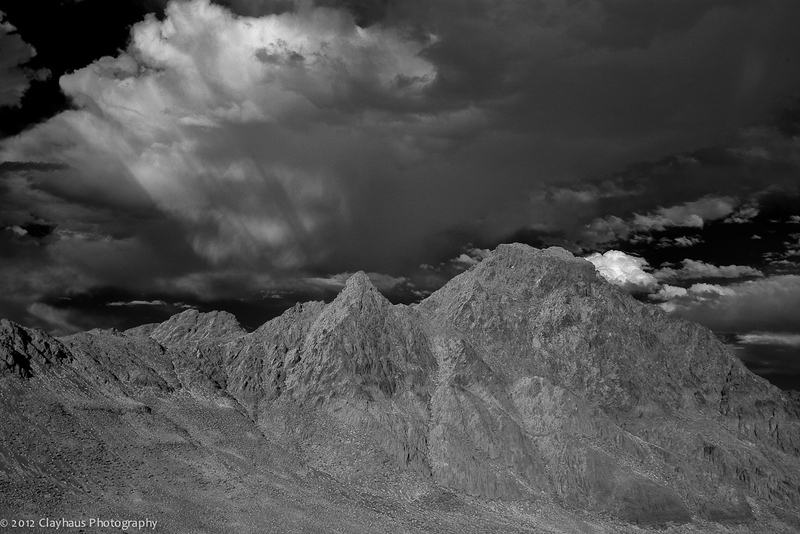 For the photographer, the often dramatic play of light and shadow, clouds and sky, water and rocks, furtive wildlife and sweeping vistas are perfectly suited to black & white or infrared photography. We see light in the visible spectrum, with wavelength measurements of between about 380 and 750 nanometers. The near-infrared spectrum slightly overlaps with and extends just beyond visible light in the 700 to 900 nanometer range. This infrared “light” is invisible to us, but when rendered on film or via digital technology, yields sublime, sometimes startling results. Typically, infrared photographers will create ethereal, otherworldly false-color images or convert those images to more conventional-looking black & white photographs. But conventional they are not, if one looks more closely. Skies and water can take on an inky blackness, while clouds will ‘pop’ in dramatic fashion. Foliage becomes milky white and grass is often mistaken for snow. Depending upon atmospheric conditions, images can be preternaturally, almost topographically sharp or soft and gauzy with a ghostly dreaminess. Since 2005 I have traipsed this vast region with a variety of IR-sensitive cameras in-tow. These cameras are fitted with different wavelength infrared filters that ‘cut-off’ visible light and are manufactured to capture the IR spectrum at the varying spectral depths of 720, 780, 830, and 850 nanometers. 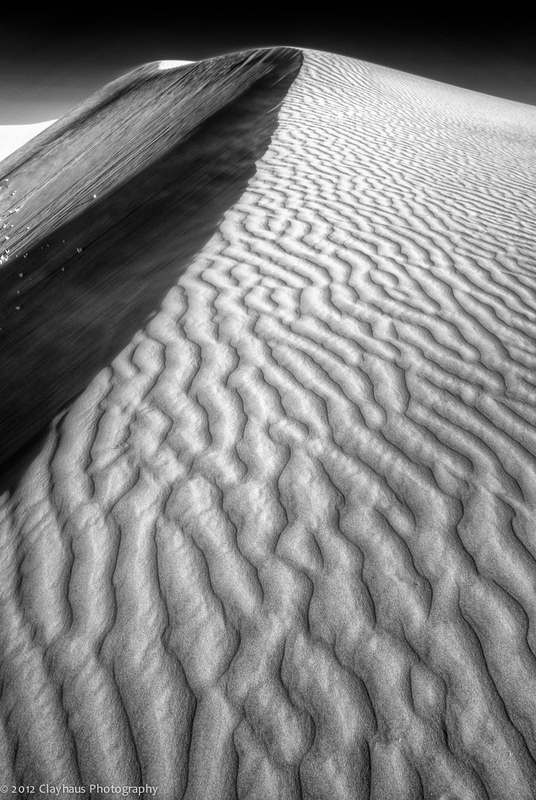 I will occasionally convert captured images to duo-tones but more often I prefer rendering the West Desert in contrasty black & white. While acting as formal compositional exercises – utilizing as well as ignoring various photographic “rules” – I strive more to reveal the many moods of this expansive desert region. 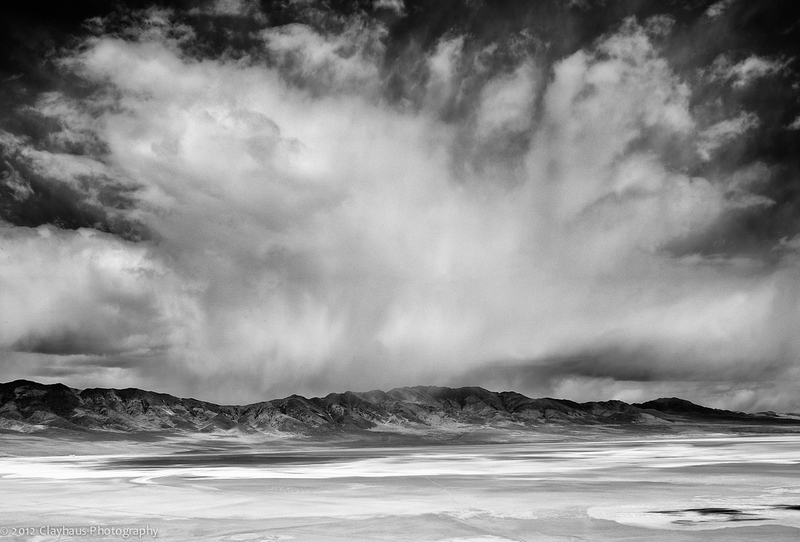 Whether it is a calm autumn day on some unnamed peak, a wintry morning in a forgotten desert valley, or a tempestuous spring storm afternoon on the Great Salt Lake, Utah’s West Desert can be a fascinating study for one willing to see things in a different light. Jeff, made myself a cupa so I could enjoy your musings as I sipped. I like the 1st and last pics especially and of course your writing, which I always can make time to read. A cup of tea — or a beer — are fine refreshments for enjoying the West Desert! Thanks for reading!